My name is Jonathan Tucker. I have been a Ham Operator for over 20 years, currently holding an Extra Class license. My previous callsign when I was first licensed was KB8JDK. 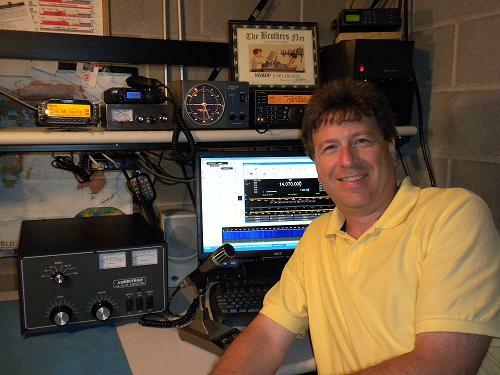 I enjoy operating on 10-80 meters SSB, PSK, and RTTY. I also enjoy SSTV and Digital SSTV. I am also taking a renewed interest in the various Digital Modes (OLIVIA, CONTESTIA, etc). One of the most interesting digital modes is HF FT8. Don't be surprised if you find me on 80m, 40m, and 20m working FT8. I just completed WAS on 80m, and almost have WAS on 40m and 20m. See you on the bands! My website offers a number of resources where you can not only learn about my station, different operating modes, and search my QSO/QSL Card databases, but you can learn how I put some of my radios online, including SDR systems that use Single Board Computers (Raspberry Pi, Arduino, etc). I have also been adding recently a number of YouTube videos that are educational as well as informative. I even try to link to some nostalgic videos too! My QTH is about 26 miles to the east/southeast of Cleveland, Ohio in a small community called Auburn Township in the county of Geauga. My home is on 2.5 acres at an altitude of 1207' ASL. • My policy on eQSL. I don't use it. So please don't rely on me to confirm with eQSL! If you have any QSLing questions for me, please send me an email at ars_n8mdp@windstream.net to let me know how to send QSL cards to you for DX contacts. Please feel free to look around, and drop me a note if you have any questions or comments. I am also an aviation buff. I have always wanted to learn how to fly but that goal continues to elude me. 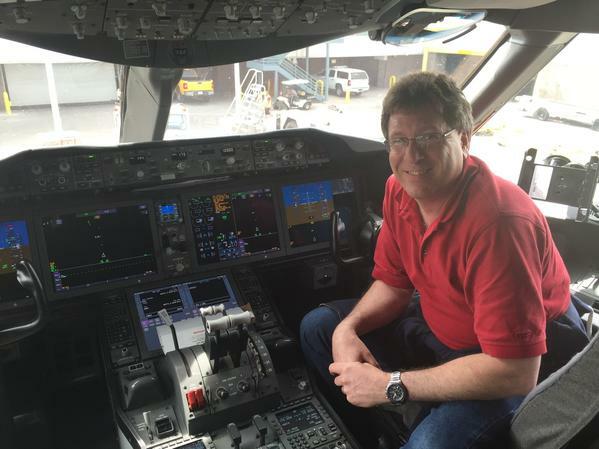 I had the opportunity to fly home from Tokyo on the new Boeing 787 Dreamliner. After the flight, the pilot allowed me to sit in the co-pilot's seat to take my picture. Thank you United Airlines for the view! Julie and I love Hawaii, especially the island of Kauai. This picture of us is with our backs to the Waimea Canyon in 2008. This is essentially the grand canyon of Hawaii. Julie and I returned to Hawaii in 2010 to celebrate our 25th wedding anniversary. We celebrated our anniversary on Maui with some rowdy local girls at the Old Lahaina Luau and then went back to Kauai to renew our vows on Shipwreck Beach. The beach was right around the corner from where they filmed a portion of the movie "Six Day, Seven Nights" with Harrison Ford. Julie and I returned again to Maui and Kauai in 2013. Just can't get enough of Hawaii! Here are some of our favorite pictures from Kauaii. Julie and I celebrated our 30th Wedding Aniversary in 2015. We went on a spectacular trip to Utah and hiking the many national parks (Zion National Park, Bryce Canyon, Northern Rim of Grand Canyon, and Capital Reef National park. A little bit of Vegas too! Here are some pictures we took. The views are spectacular. Julie and I returned again to Maui and Kauai in 2016. Seriously, we just can't get enough of Hawaii! Sometimes I wish we could live there. We enjoyed a beautiful sunset cruise on Maui that was spectacular. On Kaui, we hiked our butts off into the back country and into the Waimea Canyon to see sights we've never seen before including Waipoo Falls. And of course, spectacular sunsets. Besides Ham Radio, my interests include: Aviation, Ziplining, Warm Beaches, Hawaiian Sunsets, and developing web pages! I am a member of LinkedIn and you can view my profile here.